modeling of a low poly landscape mesh. 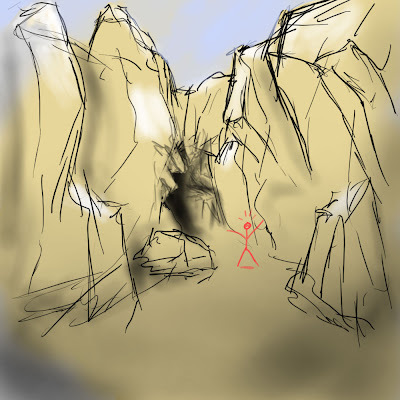 meaning a canyon/cave entrance surrounded by rocks. and sculpting a rock normalmap in mudbox, as also painting the diffuse map for the rocks in photoshop with the help of phototextures. then i personally model it with "plane"-modeling in 3dsmax 2010, meaning: extruding edges with the shift+move tool. to achieve organic look and feel, scale random edges after extruding. use the "blend"-script from the "polymagus action items"-scripts to assign the blend-script to the space-bar..then you will model light-speed-like :). 3dsmax has a new cap tool in the graphite modeling tools that is capable to blend edges, that share one vertex, with only one click on a button. but you still cannot assign this button to a key...so still this blend script is the only valid solution for high speed modeling. for the normalmap, we used mudbox to sculpt the topology on a plane. do not forget to create many topology features on the plane, to be able to map this texure some bigger on the landscapes. then make this map tileable in PS. after rendering the normalmap, you can also render an ambient occl. map in mudbox. this can be used for a base in photoshop to paint the diffuse. 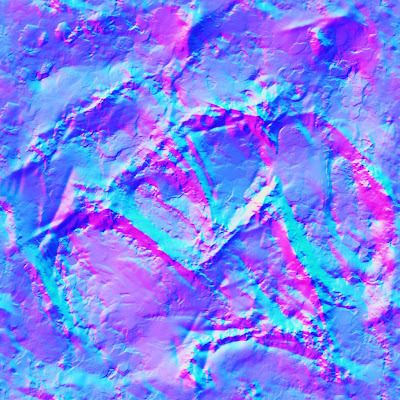 or you use the blue channel of the normal map in photoshop, which mainly acts like a cavity map. the stone normalmap itself is copied and blended with overlay 2 or even 3 times. 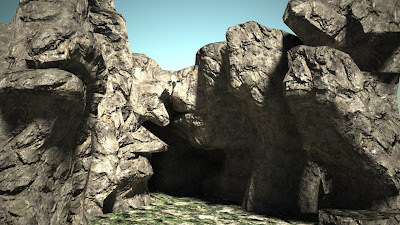 i recognized, that it is helpful for rock or stone structures to have a real strong or even overdone normalmap. so i overlayed it 2 times. but do not forget to normalize after the first and second overlay. or try to overdo it in mudbox, with the sculpt. that's the normal, you see how it looks overdone. but it works actually better in this way, at least for rocks! tomorrow we will sculpt a stone, make some 3d grass, and then arrange it in the scene. then render it.